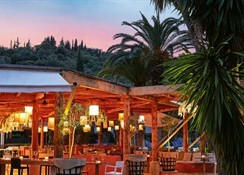 The Grecotel Daphnila Bay Thalasso literally tumbles down the green hillside overlooking Dassia Bay in Corfu. All well appointed guestrooms feature a balcony or terrace, and satellite TV. Rooms are overlooking the gardens and Ionian Sea, while bungalows are hidden amongst the olive trees. 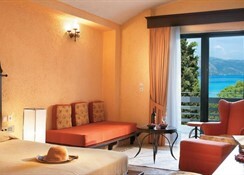 The Grecotel Daphnila Bay offers a wide choice of facilities for all age groups. 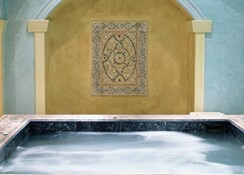 Large swimming pools, children and teenagers’ clubs, sports, fitness and spa facilities are offered. A host of restaurants offer varied menus by the beach, by the pool or in the main building. 24 hour reception service and extensive concierge services are also provided. Nestled amongst fragrant olive and pine trees, the Grecotel Daphnila Bay Thalasso offers a luxurious stay in beautiful surroundings. Unwind on a sunlounger around one of the sparkling pools or on the private sandy beach. At mealtimes head to the restaurant, which offers a wide choice of local and international dishes in its buffet. There are also tasty snacks available at various times during the day if you get peckish. The entertainment team is on hand to keep you amused both day and night offering pool games, sports and shows. If you want to be pampered then head to the spa where a great range of indulgent treatments are on offer to leave you feeling relaxed and refreshed. The accommodation itself is tastefully decorated in earthy tones and has all you need for a fantastic stay. The widest selection of show cookery is probably at the Daphnila Bay Thalasso hotel. Open for breakfast, lunch and dinner with delicious Greek and international specialities. Starters, soup, main courses, salads and desserts are found on the extensive buffets whilst the chefs give live cookery demonstrations. Children's dinner buffet available and Weekly various theme nights. Sunday greek lunch is served in the main restaurant. The NEW Giardino di Mama beach restaurant is just the place to dive in for a handmade pizza served piping hot from the pizza oven or the chef’s pasta fresca. 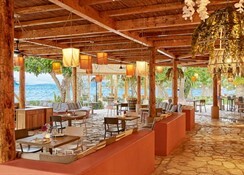 The Corfiot décor with stone benches and mosaic tables gives a cool ambience to this new Corfu hot spot. Yachters anchor off shore as the Italian aromas waft over the Ionian. Open for lunch buffet and a la carte dinner (weather permitting). Enjoy refreshing drinks, coffee, cakes and snacks throughout the day and afternoon. For many guests, the evening begins at the lobby bar veranda overlooking Dassia Bay while sipping creative cocktails. • GrecoBaby Equipment for 0‐3 years for rent or free of charge (see below). • Sports activities including water polo, mini soccer, watersports etc.